While there’s nothing wrong with a little indulgent behavior during a Las Vegas trip, a few bad decisions can quickly turn a nice vacation into a miserable vacation. 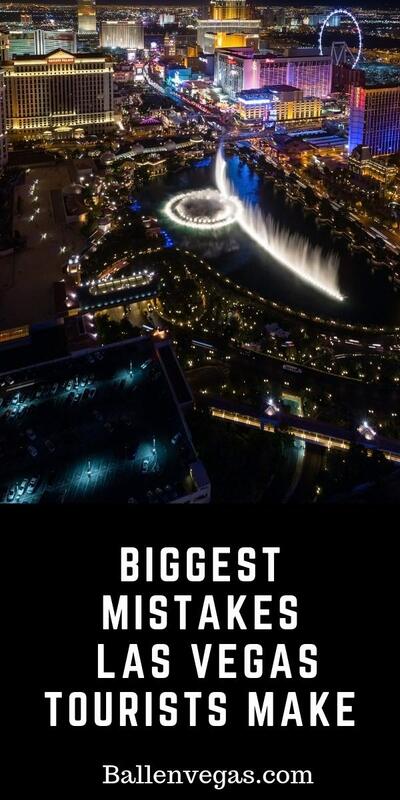 During your upcoming trip, steer clear of the following common tourist mistakes in Vegas. If everyone had good odds of beating the house, casinos wouldn’t be in business. You will win sometimes, which is part of the game. When people do well and get excited about the potential of a big payout, they keep gambling. Keep your head while you’re gambling. Quit when you’re ahead or know when to cut your losses and walk away, so you don’t empty your entire bank account. People are in a good mood when they’re up at the casino. Consequently, they treat their bartenders better. Unfortunately, the opposite is true when people are down. Don’t let the outcome of your gambling affect how you treat the bartenders and other casino staff. Be respectful and always tip well. There’s so much to do in Las Vegas. You want to fit in as much as possible. Be honest with yourself about your stamina. Get a good night’s sleep each night and build in time during the day to recharge and rehydrate. After a full morning of sightseeing or walking the Strip, plan for a few hours at the pool after lunch before you hit the town again. Here’s a list of Las Vegas pools to check out. A trip to Las Vegas involves a lot of walking and time on your feet. From navigating the Strip to hanging out at the casinos to hitting the clubs for drinks and dancing, your feet will wear out more quickly than you think. Unless you know that you’re just heading out for a couple of hours and then going straight back to the room, skip the high heels and binding party wear and opt for a great pair of walking shoes. Las Vegas is laid out deceptively, making tourists believe that it’s a short walk from one hotel to the next. People underestimate what there is to do on Fremont street and the length of the Las Vegas Strip. Each resort complex is huge. It can take 20 minutes just to get out of your hotel and make it over to the casino in the neighboring hotel. In the summer, the heat catches up with you quickly, especially when you’ve been drinking and aren’t acclimated to the desert climate. Know where you’re going, so you don’t waste a lot of time wandering aimlessly. Be smart about when and how long you’ll be outside during the hottest parts of the day. Don’t hesitate to grab a Lyft or Uber as needed. Most people who visit Las Vegas never leave the Strip, which is a big mistake. When you’ve traveled this far, it’s worth seeing all that the area has to offer. At a minimum, spend a day in Old Vegas. Ideally, build in enough time in your trip to spend a couple of days visiting the Red Rock Canyon and Hoover Dam, both of which are within an hour’s drive of the Strip. If time and budget allow, take a day trip or an overnight trip to the Grand Canyon as well. Las Vegas is situated in the middle of the desert. Even during the winter, it’s much drier in Vegas than it is in many parts of the country. You can find yourself dehydrated very quickly, particularly when you’ve been drinking and not getting enough sleep. Order water at every meal and drink a full glass. When you’re walking outside for more than a few minutes at a time or taking an excursion, such as to the Hoover Dam, bring water along. It’s also a good idea to bring some electrolytes to add to your water. Food and drinks in Vegas are expensive, as are many of the shows and other entertainment options. Most bars and clubs on the Strip charge an automatic service fee and an entertainment fee. You can’t avoid these fees, so plan accordingly. Create a daily budget and stick to it. Whenever possible, book discounted shows and tours. Take advantage of free entertainment as well, such as the Bellagio fountain shows and Fall of Atlantis at Caesars Palace. Also, be sure to look at the latest on Groupon and enjoy discounted attractions and dining. The buffets in Las Vegas are great but just one of the numerous food options available in the city. Branch out and try at least one new restaurant every day. Las Vegas offers something for everyone with a vast variety of cuisines. Spring for at least one fancy meal or restaurant experience that you wouldn’t try at home, such as a Brazilian steakhouse. Each year dozens of pedestrians get killed while attempting to cross the Strip at street level. Most of these deaths occur at night. It may seem like a pain to find a walkway every time you want to get to a restaurant or casino on the other side of the street. The walkways exist for a reason and are well worth the extra few minutes. The walkways exist for a reason and are well worth the extra few minutes. Check out the tram and other ways to get around town. The Strip is packed on the weekends with restaurants, shows, and clubs booking well in advance. Don’t expect to walk up to a restaurant without a reservation or get tickets the night of a show. Make a game plan at least a few days ahead of time, so you aren’t improvising at the last minute and getting stuck with entertainment you don’t want to do. Driving in Las Vegas is a nightmare, particularly on the strip. If you aren’t planning to go beyond the Strip and Old Vegas, don’t rent a car. Use Uber and Lyft services when walking isn’t the best option. Otherwise, you’ll spend a ton of time sitting in traffic and will pay an arm and a leg for parking. Many people make their worst decisions in Las Vegas due to peer pressure. Don’t let your crazy drunk friends talk to you into having one shot too many or spending more money than you intended during a hot night in the casino. They may give you a hard time in the moment, but you’ll thank yourself later (and they may thank you, too).